President Barack Obama on Wednesday flew to North Carolina to rally support for his new manufacturing initiatives—the first in a series of planned trips this week to advocate the agenda he outlined on Tuesday night in his State of the Union address. 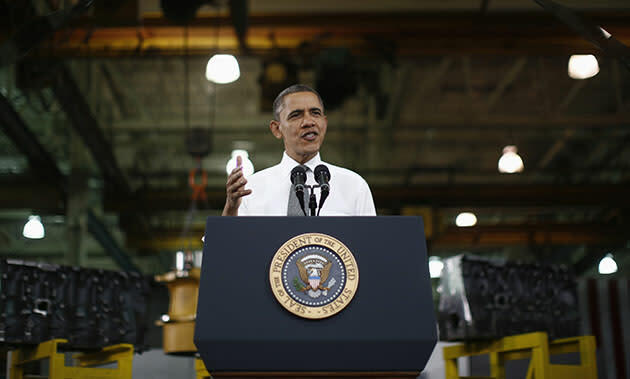 “Our job as Americans is to restore that basic bargain that says if you work hard, if you’re willing to meet your responsibilities, you can get ahead," Obama told workers at the Linamar Corp. in Asheville, N.C.
"If you work full time, you shouldn't be in poverty," he later added, noting his proposal Tuesday night to increase the federal minimum wage to $9 an hour. Linamar was chosen for Wednesday's trip because as a Canadian manufacturing company employing 160 Americans—and scheduled to increase that number this year—it's an example of the type of "insourcing" the president hopes to expand with his new manufacturing initiatives. The president on Tuesday night proposed creating three additional U.S. manufacturing institutes this year and called on Congress to fund 15 more manufacturing institutes costing $1 billion. There are "steps we can take right now to strengthen our recovery but also to build up our middle class," Obama said on Wednesday. He spent much of Wednesday's 15-minute address echoing his State of the Union speech, calling for strengthening the middle class and highlighting positive signs of economic growth, such as the recent increase in manufacturing jobs. Obama is expected to deliver a similar message this week during a Thursday trip to the Atlanta, Ga., area and in Chicago on Friday—where aides say the president will address gun violence as well as his economic agenda.